Camaro vs GT-R? 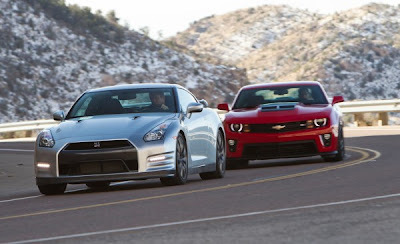 Isn't this supposed to be Corvette vs GT-R? Inside Line, just recently compared the 2012 Z06, and the Nissan GT-R, but in this test Road and Track magazine pits the new supercharged ZL1 Camaro vs the just updated 2013 Nissan GT-R. The ZL1 against Godzilla? Yes indeed. As illogical as that may seem, both cars have massive horsepower, weigh 2 tons, have 2+2 seating and feature a variety of go-fast goodies. 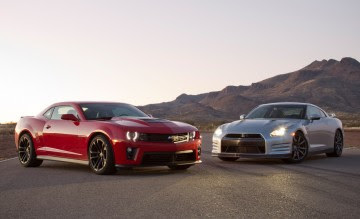 On the track, even with the magnetic suspension, PTM traction control, and 580 supercharged horses, the ZL1 Camaro can't keep up with the 545hp GT-R. The clocks show that the ZL1 is 2.8 seconds off the GT-R at Inde. Even with PTM, no-lift shifts and launch control, the ZL1 is simply the harder car to drive. It’s heavier by nearly 200 lb., thanks in part to a beefy 9.9-in. differential that’s built to handle the torque but is nearly twice as heavy as that used in the SS. Chevrolet introduced a new Camaro model, the ZL1, at the 2011 Chicago Auto Show. The ZL1 features a supercharged and inter cooled 6.2 L V-8 engine that will produce an estimated 580 hp (430 kW) and 556 lb·ft (754 N·m) of torque. Looks like R&T should have considered pitting the ZL1 against the 370z instead.